Hear funny stories from Brad Montgomery and David Glickman that have happened both on and off stage. Announcing the release of Comedy War Stories, a new audio recording in our WellAttended Academy. Brad Montgomery sold this on his website for $20, but you can get it today for free! Grab it today before we realize that we've lost our minds. If you're like us, you love hearing crazy fiasco and disaster stories from folks about their jobs. You may also think it's fun to her what comedians talk about when the show is over. And you may want to learn about the crazy things that happen to comedians on the way up their career ladder. Well, lucky you! We have a 65 minute audio recording that you'll love. 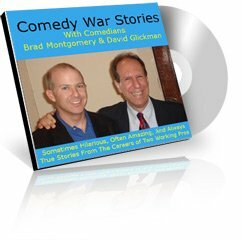 Corporate Comedian David Glickman and Brad Montgomery recorded a once-in-a-lifetime program when they were working together in California, and we are lucky they got it on tape. This audio recording is a hoot. David and Brad tease each other in a funny way, and the stories (all of which are true) kept the audience on the edges of their seats. Looking for something funny and positive to listen to on the way to work? How about a look behind the curtain of some entertainers? Are you interested in learning what it takes to become a comedian yourself? “Not only were the stories funny, but it was helpful for me to learn that even seasoned pros have so many stories of crazy thing gone wrong. Apparently I’m not alone. I’m getting a copy for my sister!" Don’t read this if you don’t want to learn the hilarious things that actually happen to comedians. If you’ve always wanted to hear about funny things that happen to comics both on and off stage, then this recording is for you. Ever wondered what comedians talk about when they tell each other stories from “the road?” Want to hear a few disaster stories from two working comics? Want to hear hilarious anecdotes from early on in their careers? And some funny stories that have happened recently? Well lucky you, because this audio recording features a program recorded live before the National Speakers Association of Northern California where Brad and David candidly (and humorously) share stories from their comedy past. Tell me More About This Cool Recording from Brad! Some crazy things that happen to comics new in their career. What happens when an experienced corporate comedian, who’s paid big bucks, fails to deliver. Do seasoned pros bomb? And what happens? The craziest thing that happened to Brad during his career when he worked for college audiences. And what that has to do with pizza. The story behind David pranking Gloria Estefan. This is a live recording, and it was one of those once-in-a-lifetime events that will never be repeated. The energy these good friends is terrific, and the audience was having a blast. These are not excerpts from their polished stage performances. These stories are told off the cuff and with enough heart and humor to keep you laughing. Unrehearsed and unpretentious. Often painful. And always true. So peek behind the curtain and learn what really happens in the sometimes not-so-glamorous world of show business. Get ready to laugh, because it’s Comedy War Stories with Comedians Brad Montgomery & David Glickman. If you have 1/3rd as much fun listening to this recording as David and I had in making it, you’re in for a fun ride. This recording gives a glimpse into the real world of comedy and entertainment. If you want to hear some crazy stuff, you’ll love this. Thanks so much. P.S. This recording is great for the car. And your family will dig it too! WellAttended is a simple way to sell tickets online. Join our online academy to learn strategies to find venues, sell more tickets, and excel as an entertainer. Get course updates, launch info, and special deals by signing up for our newsletter. You'll receive 10 audio lessons where Brad and David share funny stories from their careers as keynote speakers. The course is currently available for you to take at your own pace. The only deadline is your own drive to become a motivational speaker! Will I get access to the course all at once? Yes! All of the material will be instantly available. If you need help with something related to the course, please contact william@wellattended.com. Thanks!